John, a former colleague, entered our favorite coffee shop. His arrival was not unusual for a Friday morning. But he usually didn’t arrive carrying a magnolia blossom. 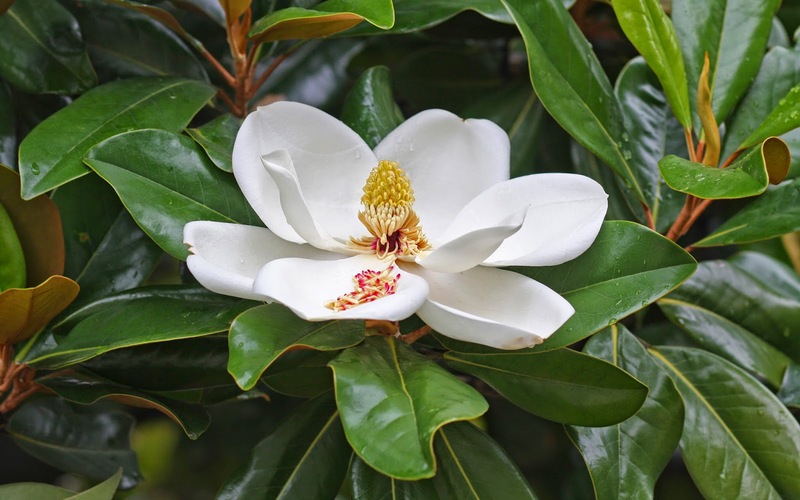 He looked around, obviously searching for an appreciative recipient for the near perfect specimen of Mississippi’s state flower, Magnolia grandiflora. He explained it was the last bloom from a magnolia on his property and one of the rare blooms to develop low enough for him to pick and share. He set the flower on our table. I have seen magnolia trees and the blooms of this southeastern United States native all my life. I spent some moments enjoying the extravagant loveliness of John’s iconic Deep South flower. I was quite familiar with those large, creamy white petals that surrounded a distinctive, sturdy yellow stalk and the stiff, glossy green leaves that framed the bloom before me. Then I held it close to my nose and sniffed. How had I never before encountered that distinctive scent? For the first time in my 65-plus years I experienced the magnolia blossom's clean, lemony fragrance. It has to be a significant sensory facet of the moonlight and magnolia mystique. Not for the first time I wondered: What else have I been oblivious to for much of my life? I am amazed at what I learn at this stage of life—knowledge and insights about things both simple and complex that have surrounded me for more than six decades. But I spend no time worrying about why. I am just thankful to be here to learn and enjoy. I don't know what a magnolia flower smells like...but now I am so curious! Oh the joys and wonders that our Lord created for us to enjoy! How nice of him! They are huge and beautiful flowers. BUT I have never smelled their smell, now I must go see if the tree down the street is still blooming. But the flowers are so HIGH! I liked this post, and the term "moonlight and Magnolias", as well! Magnolias are among my favorite trees! We've had a Magnolia tree in old our yard for many years. We used to love smelling its wonderful Magnolia scent, while sitting on our backyard pool deck. I loved the blossoms, too, but rarely could I ever reach one to pick it! These days, the pool and deck is gone, but we still rely on that old Magnolia tree as the one of the few shade trees, since moving next door. I have a yard swing and a hammock located underneath it! Well someone said, stop and smell the flowers. Sounds about right. I love the Magnolia, but have not had one on many years. Someday, I will have to drive out to the old homestead and check out the tree I planted in 1975. Perhaps, as it was out in the country, it's still there. Thanks for jogging my memory, yet again. How kind of the gentleman to give you the blossom. I have never smelled a magnolia either. Linda, I really like how you ended your post. I think I often miss things that are right in front of my nose. Even late in life there are second chances. I am so grateful. I found this post quite interesting. I am somewhat amazed that you had never really smelled this flower. Isn't that a lesson for us all? How much do we miss? I worry and wonder about that as I pass through life without observing much of what I should and missing many richness around me. This flower is truly exquisite. Oh, that's lovely. Thank you for telling us about it.